Bungee cord is made of one or more strands of an elastic material, usually rubber, bound together by a fabric covering. It is commonly used as a tie-down for luggage or equipment carried on the outside of a vehicle. Bungee cord is also used by the military to absorb the opening shock of the large cargo parachutes when dropping heavy loads such as tanks. The development of long, heavy-duty bungee cord for the military has led to the recreational sport of bungee jumping. In this sport, the participant jumps from an elevated structure while wearing a harness attached to one end of a long bungee cord with the other end attached to the structure. The term "bungee" or "bungie" is thought to be British slang for india-rubber. Some references to the india-rubber originally used for erasing pencil marks on paper call it "india-bungie." Another source claims the term was derived from the Anglo-Indian word "bangy" referring to the colloquial term for a yoke carried on the shoulder with two equal loads suspended by cords front and rear. In either case, the concepts of an elastic material and load-bearing cords both apply to the modern bungee cord. The history of bungee jumping as a sport or test of courage is believed to date back 1500 years to Pentecost Island in what is now the Republic of Vanuatu in the South Pacific. According to local legend, a wife felt she was being mistreated by her husband and fled, taking refuge in a tall tree. As her husband was climbing the tree in pursuit, she secretly tied vines around her ankles. When he tried to grab her, she jumped. He jumped after her and fell to his death. The springy vines broke her fall and she lived. After that, the men of the island decided that no woman should ever trick them again, and they began to practice jumping with vines. In time, it became a test of courage, with the bravest men jumping from a height of 80 feet (24 m) to have their heads brush the ground before the vines completely stopped their fall. Modern bungee jumping using elastic bungee cords started in the late 1970s. On April Fools' Day in 1979, the Oxford Dangerous Sports Club of Britain caught the public's attention when members bungeed off the 245-foot (75 m) Clifton Bridge in Bristol, England. Since that time, bungee jumping has become a commercialized sport with thousands of participants. rubber, or a mixture of both. Reclaimed rubber may not be used for milspec cords. Natural rubber is widely used for cords used in bungee jumping. The fabric covering for the bungee cord may be braided from cotton or nylon yarn. Commercial bungee cord usually has a single layer of nylon covering which is more resistant to abrasion and has a higher tensile strength. Mil-spec bungee cord is required to have two layers of cotton covering. Some cords used for bungee jumping have cotton covering, the same as the mil-spec cord. Other specially designed bungee jumping cords have a braided covering of natural rubber. Standard commercial bungee cord is available in diameters from about 0.25-inch to 0.62-inch (0.64-1.6 cm). Mil-spec cord is available from 0.25-inch to 0.87-inch (0.64-2.2 cm) in diameter. These cords require no new design work other than an occasional change in the colors of the outer covering. (See Quality Control). Bungee jumping cord is usually about 0.62-inch (1.6 cm) in diameter and is usually individually designed by each bungee jumping company to its specifications. Custom-made bungee cord may be required for special applications. When one light truck manufacturer decided to demonstrate the strength of their product's frame, they sent the vehicle bungee jumping off a bridge. This stunt was featured in a commercial on national television and required a set of nine specially designed bungee cords, each 5 inches (13 cm) in diameter and 100 feet (30 m) long. process by which commercial or milspec bungee cords are manufactured. 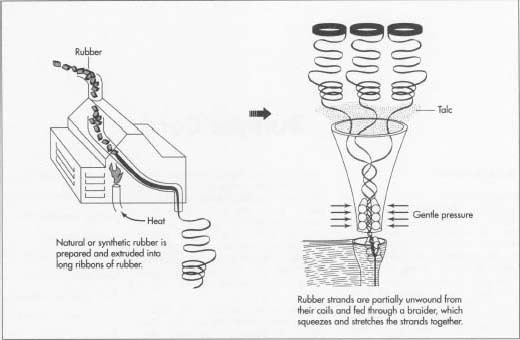 1 Natural or synthetic rubber is prepared and extruded into long ribbons of rubber. These ribbons are approximately 0.09 inch to 0.12 inch (0.24-0.32 cm) thick, 0.25 inch (0.64 cm) wide and up to 100 feet (30 m) long. The extruder consists of a heated cylinder into which the rubber is placed. One end of the cylinder moves under pressure to force the rubber out through a small hole in the other end. The hole, or die, is in the shape of the desired ribbon cross-section. When the rubber ribbons have cooled, they are coiled and shipped to the bungee cord manufacturer. 2 The number of ribbons, or strands, in a bungee cord determines the diameter of the cord and the overall tensile strength rating. The appropriate number of rubber strands are partially unwound from their coils. To prevent the individual strands from sticking to each other in hot weather, they are coated with finely powdered talc or soapstone. This is done continuously as the strands are being unwound from the coils during the braiding process (steps 3 and 4 below). 3 The free ends of the rubber strands are brought together and manually fed through a machine called the braider. At the input end of the braider, they pass through a roller or other device which gently squeezes them into a bundle. At the other end, another roller or a take-up reel pulls the strands through the machine. By adjusting the pressures and speeds of the input and output devices, the rubber strands are placed under tension and slightly stretched while they pass through the machine. This reduces the diameter of the bundle of rubber strands to allow the fabric covering to be wound tightly. 4 The braider weaves the covering yarn around the stretched rubber bundle as it passes through the machine. The yarn must be woven in a tight enough pattern to prevent dirt from entering gaps between the yarn threads when the cord is fully extended. If two or more layers of covering are required, they are woven one after the other. The outer covering yarn may be colored and woven in a pattern for age dating or decorative purposes. (See Quality Control). 5 The finished bungee cord is cut to length, coiled, and placed in cardboard boxes for shipping. Some cords are first placed in dark plastic bags as further protection against ultraviolet radiation during handling and storage. 6 The end fittings may be attached by someone other than the bungee cord manufacturer. In the case of commercial bungee cord used as luggage and equipment tie downs, another manufacturer or distributor cuts the bungee cord into the required lengths, doubles each end over and tightly coils a stiff wire around the ends with a wire coiler machine. The other end of this wire is usually bent into a j-shaped hook to allow the ends to be secured. 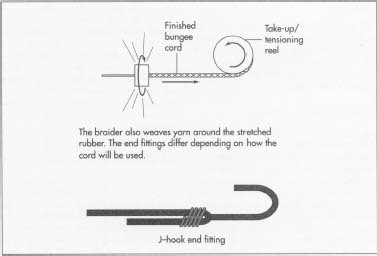 Bungee cord used for bungee jumping may have the ends bent around a non-metallic eye and wrapped with a strong, waxed string, called whipping, that is wound tightly while the cord is stretched. Other end fittings may involve sewing the cord to fabric webbing. Bungee cord is subjected to different levels of quality control depending on the final application. These usually consist of visual inspection, testing, and labeling or color coding. All bungee cords are given a visual inspection for defects in the rubber strands and covering during manufacture. Defects include broken strands, improperly woven covering and noticeable stains on the covering. Commercial bungee cord rarely requires any testing. Mil-spec cord, on the other hand, must undergo a rigorous series of tests, including size and weight measurements, tensile strength, percent elongation under various loads, and a number of extension-contraction flex cycles. For example, a 0.62-inch (1.6 cm) diameter mil-spec cord must weigh 14 pounds per 100 feet (or 6 kg per 30 m), support 250-350 pounds (113-159 kg) at 100% elongation, have a minimum breaking strength of 500 pounds (227 kg), and be able to endure a minimum of 50,000 flex cycles. Manufacturers of bungee cord for bungee jumping have their own standards which may include subjecting the cord to a number of full flex cycles and measuring the change in force versus extension to ensure the cord does not overextend. Bungee cord performance can be affected by age. Cord built to military specifications must be shipped to the end user within six months of the date it was manufactured. To ensure compliance with this requirement, mil-spec cord uses a color-coded outer covering to indicate the date of manufacture. The main color indicates the year as follows: red (1992), blue (1993), yellow (1994), black (1995), and green (1996). For succeeding years, the cycle of colors is repeated starting with red again for 1997. To further define the date of manufacture, a second, minor color is incorporated into the outer covering as follows: red (January-March), blue (April-June), green (July-September), and yellow (October-December). Some bungee jumping companies which make their own cord use a different colorcoding system to identify the load capacity of the cord rather than the age. This color is often sewn into the webbing attached to the harness end of the cord to ensure that the proper capacity cord is matched to the weight of the jumper. The age of the cord is controlled by periodic testing and regular replacement cycles. The colors on the outer covering of commercial bungee cords have no significance and are for decorative purposes only. Commercial bungee cord is a simple, lowcost product with numerous uses. It will continue to be used for the foreseeable future. Likewise, the military is expected to continue to use the current bungee cord design in numerous applications. Bungee cord used for bungee jumping has evolved into a specialty product. Because of concerns with liability, many commercial manufacturers no longer manufacture or sell cord for bungee jumping. Companies that promote bungee jumping as a sport now manufacture their own cord to their own specifications. The specifications and manufacturing processes vary from one company to another and are considered highly proprietary. The primary concern, of course, is safety for the jumper. To that end, these companies will continue to have very tight controls over the manufacturing, handling, testing, and replacement process for their cords. Frase, Nancy. Bungee Jumping for Fun and Profit. ICS Books, 1992. Gromer, Cliff. "Jumpin' Jimmy: To Prove the Strength of Its Frame, GMC Truck Goes Bungee Jumping." Popular Science, March 1993, pp. 56-57. Sterba, James P. "Vanuatu Visitors See Origins of Bungee Are Sort of Darwinian." Wall Street Journal, June 1, 1993, p. Al.